Terms related to IBM licensing. There are various IBM capacity-based (hardware) metrics, from Processor Value Unit (PVU) to Resource Value Unit (RVU). User metrics, such as Authorized User (AUTH) or Concurrent User (CONC), may impose further restrictions and be sub-divided into additional metrics, such as Floating User Single Session Single Install (FUSSSI). Full Capacity and Sub-Capacity counting rules may alter metrics. IBM publishes metrics and licensing requirements in Program Announcement Letters (PLETs) and Licensing Information (LIs). Terms related to IBM compliance audits. An audit starts with the receipt of an Audit Announcement Letter (AAL). Deployments are collected in an IBM Server Workbook (ISW) and generate the license demand. IBM entitlements (licenses, maintenance, reinstatements) are collated in the Effective License Position (ELP) and matched to deployments to create the License Compliance Table (LCT). After the EXIT meeting, the vendor and customer settle with an audit relief. Terms related to the purchase of IBM products. Customers usually purchase IBM entitlements – licenses, maintenance, reinstatements, migrations – under the International Program License Agreement (IPLA). Customers may agree on Passport Advantage – the International Passport Advantage Agreement (IPAA). Further agreements, such as the Enterprise Licensing Agreement (ELA) or (i)ESSO, need thorough analysis before signing. Audit (Licensing Compliance Audit – Compliance Review – Self-Assessment) |An examination of the licensing compliance/incompliance position of an IBM customer. IBM has implemented a comprehensive audit program worldwide, performed with the support of external auditors such as KPMG and Deloitte (refer to kpmg.com and deloitte.com for program details). These compliance audits drive for the discovery of, and subsequent compensation for, any unlicensed software discovered. Audit Announcement Letter (AAL) | Letter from IBM formally announcing the start of a compliance review to an IBM customer. The Audit Announcement Letter should at least show the objectives of the audit, nominate the IBM audit contact and the mandated auditor, in addition to proposing a start date and defining the audit scope (products, entities, countries). On receipt of this letter, the IBM customer loses the right to re-establish compliance outside of a – usually more expensive – settlement. Audit relief | Part of the audit settlement agreement, in which IBM (the vendor) agrees not to pursue the customer for the incompliance reported in the audit. Customers should note that only the past history of reported installations is relieved, hence any (future) additional incompliance and any (past and future) non-reported usage can be audited anytime and pursued by the vendor. Authorized Program Analysis Report (APAR) | Formal report to IBM concerning the development of a problem or a suspected defect in a current release of an IBM program. Authorized User Single Install (AUSI) | One of IBM’s user metrics. The AUSI metric is a development of the Authorized User metric with a restriction on the number of installs accessed. The licensee must obtain separate, dedicated entitlements for each Authorized User accessing the Program on each Install in any manner, directly or indirectly. An example of a product licensable using the AUSI metric: IBM Informix Growth Edition V11.70. Authorized User (AUTH) | IBM’s predominant user metric, in which the number of unique users who have access to the program are counted. AUTH leads to other user metrics by applying supplementary restrictions, e.g. restriction on installations as in the Authorized User Single Install (AUSI) metric, restriction on time as in the Concurrent User (CONC) metric, or restriction on both (installation and time) as in the Floating User Single Session Single Install (FUSSSI) metric. AUTH may also have further restrictions, such as restrictions on the user (employee, external, etc. ), or on limited secondary use rights. An example of an IBM product using the metric AUTH: IBM Lotus Notes 8.5. Authorized User Value Unit metric (AUVU) | One of IBM’s user metrics, belonging to the family of UVU User Value Unit metrics. AUVU is a User Value Unit metric where users are authorized users. Note that IBM may offer further licensing variations such as Infrequent AUVU, for which the frequency of access to the software is limited over a certain period of time. An example of a product licensable using the AUVU metric: IBM FileNet Content Manager Authorized v5.1. Infrequent users are users with a maximum of 120 accesses per any 12-month calendar period, whereas any access within 15-minutes counts as one access. Base License Agreements | Standard agreement that IBM customers accept when they download, install, or purchase any IBM product. Base agreements are, most often, the International Program License Agreement (IPLA), which applies to warranted IBM programs, and seldom the International License Agreement for Non-Warranted Programs (ILAN), the International License Agreement for Evaluation of Programs (ILAE) or the International License Agreement for Early Release of Programs (ILAR). The base agreements, the relevant LIs and PLETs, and the current price list at time of purchase, represent the complete licensing picture of a specific product/edition/version. Base agreements contain important licensing restrictions applicable to all products. Base Line (BL) | Lowest price in Passport Advantage, slightly lower than the price in Passport Advantage Express. Customers who were enrolled in the Passport Advantage Program at a Level A, B or C before 2003 now purchase at BL level. BL does not require any points. Price levels with higher discount levels are: D, E, F, G, H, I and J for corporates or EDU/GOV for education establishments and governments. Brands | IBM’s top families of products. Brands are adapted regularly by IBM, and new products of acquired vendors are integrated (transited into PPA). Current software brands are: Business Analytics (Cognos, SPSS), ECM Enterprise Content Management, IM Information Management (DB2, Informix, InfoSphere), Lotus (collaboration), Rational (software and systems delivery), Tivoli (service management), WebSphere (integration and optimization), and System z software. Bundle package | A collection of individually orderable components or products combined into a single offering, sometimes for promotional purposes, often for technical reasons, e.g. when particular software needs other software to operate. IBM typically offers a single license to cover all components of a bundle. Bundles are important to identify as the bundle must not be licensed individually (saves costs for new licenses), but use restrictions must be abided by. CALL | A single telephone call from the Customer Designated Caller to the Support Center. An incident may involve one or more telephone calls. Support calls are used in compliance reviews to demonstrate the necessity of reinstatements. Call Center Coordinator (CCC) | A team within Lotus who will triage all customer incidents. Note: Customer support calls and incident reports will be used in compliance audits to demonstrate the necessity of reinstatements. Capacity on Demand (CoD) | See On/Off Capacity on Demand. Cognos | A product series from the Business Analytics brand. Cognos products consist of performance management and business intelligence (BI). Cognos provides functions to business users such as extracting, analyzing, assembling and displaying corporate and financial data in reports. Cognos products are IBM’s most expensive products, and have many licensing pitfalls, mostly associated with product editions and with user roles. Cognos has a leading role in settlement amounts and incompliance reports. Commercial Data | All purchased entitlements (licenses, maintenance, trade-ups, etc.) and customer’s agreements. Entitlements give customers the right to use software products of a determined edition, version, quantity, and either perpetually or for a limited period of time, with certain restrictions. Customer agreements may grant rights or impose restrictions, but do not usually comprise use rights (exceptions apply for customer contracts signed after a audit and containing an exhibit with settlement licenses). Complete Enterprise Option (CEO) | An IBM offer which standardizes and compiles use rights to a restricted product list, with the benefit of special pricing – however, with selected drawbacks to customers, especially due to the standardization. CEO contracts must be carefully thought through before purchasing. Concurrent User (CONC) | One of IBM’s user metrics. The CONC metric is derived from the AUTH Authorized User metric, by applying a supplementary restriction on time (simultaneous access). A Concurrent User is a person who is accessing the Program at any particular point in time, regardless of whether the person is simultaneously accessing the Program multiple times. Concurrent user licenses may by transferred between users. CONC may also include further restrictions such as restrictions on the type of user (employee, external, etc.). An example of an IBM product using the metric CONC: IBM SPSS Statistics Base 21.0. DB2 | A product family from IBM’s IM (Information Management) brand. DB2 is most known for the popular DB2 database. DB2 offers different licensing metrics, most of them based on PVUs (beware of products with managed devices) and users (verify using applicable PLETs/LIs). Common products are: IBM DB2 Content Manager OnDemand (licensable per Authorized User) and IBM DB2 Enterprise Server Edition Fix Pack 9.7.0.7 (licensable per Authorized User Single Install or per PVU Processor Value Unit of the installation and attached devices). Deactivated cores (POWER) | Deactivated cores are usually reported by scan tools as activated cores. Deactivated cores do not usually need to be licensed (exception: selected Announcement Letters (PLETs) or License Information documents (LIs) for a specific product/edition/version explicitly include deactivated cores in Full Capacity as they exclude limitation though operating system commands, BIOS settings, or similar restrictions.) IBM customers must be aware that this topic is subject to some discussion. Early Support Program (ESP) | A program in which selected customers get a pre-release version of a product in order to help IBM evaluate the readiness of the product, and IBM’s support. Effective License Position (ELP) | The best coverage possible derived from the customer’s entitlements, i.e. the maximization of customer’s commercial estate value. The ELP is maximized by considering the whole estate of entitlements purchased by the customer and by assembling (licensing term for: collating licenses, S&S, etc.) the entitlements in interdependency, e.g. the licenses and their subsequent S&S, reinstatements, trade-ups and migrations. Indeed, the Effective License Position offered by all entitlements combined is greater than the sum of the Effective License Positions offered by each single entitlement (the ELP of the sum > the sum of the ELP). Employee User Value Unit (EUVU) | One of IBM’s user metrics, belonging to the family of UVU User Value Unit metrics. EUVU is a User Value Unit metric with a further restriction on the user type (here employees). Note that IBM often extends per LI/PLET the obligation of licensing to all employees of the company, i.e. also to the employees not accessing the software. An example of a product licensable using the EUVU metric: IBM FileNet Content Manager Employee v5.1. End of Extended Support (EOES) | The date on which the extended support period for a specific product stops. Announced by a PLET Withdrawal. End of Marketing (EOM) | Date on which a product of a specific edition and version will no longer be available for purchase, i.e. the part number ceases to be active and can no longer be ordered from standard price lists. Announced by a PLET Withdrawal. End of Service (EOS) | Date on which IBM stops support, updates/hotfixes and maintenance of a product. Announced by a PLET Withdrawal. End of Support (EOS) | The last date on which IBM will deliver standard support services for a given version/release of a particular product. This date is one of the most important dates in the Software Life Cycle (with GA General Availability). Announced by a PLET Withdrawal. End User License Agreement (EULA) | An agreement established between the software vendor and the end user. This agreement declares the rights and restrictions related to the software usage relationship. Enterprise Licensing Agreement (ELA) | Enterprise wide agreement, standardizing the IBM offer and possibly including use rights. ELA offer benefits to IBM customers – but contain major drawbacks. We recommend a thorough analysis with each specific customer’s situation to determine whether a specific customer should enter an ELA agreement. Entitlements | All purchased contracts providing use rights to Software, i.e. licenses (perpetual and Fixed Term Licenses FTL), maintenance (Subscription & Support S&S), reinstatements and trade-ups. IBM terminology is currently: License + SW Subscription and Support 12 Months (for licenses), SW Subscription and Support 12 Months (for maintenance), Software Subscription and Support Reinstatement 12 Months (for reinstatements), and Trade Up License + SW Subscription & Support 12 Months (for trade-ups). EXIT Meeting | Presentation by the auditor to the IBM Compliance Team about the customer’s compliance position, in the presence of the customer. We recommend IBM customers accept an EXIT meeting when they feel comfortable with the auditor’s compliance calculation. We recommend customers to present their disagreements with the auditor and make sure they are noted in the meeting’s minutes. After the exit meeting, the customer will formally provide the aggregated License Compliance Table to IBM, on the basis of which IBM will make a settlement proposal. As of the EXIT meeting, the auditor leaves the review team – any changes to the compliance table must be negotiated directly with IBM. Fast Pass | The only realistic possibility to get all entitlements from corporations with a large number of different PPA sites. Contact OMTCO to receive more details. Fix Pack | A cumulative collection of all fixes available to registered customers since the last release of the product. It may include fixes that have not been previously released and can span multiple products or components. A fix pack can be applied on top of any previously shipped maintenance to bring the system up to the current fix pack level. Fix packs are usually not taken into account in licensing, but exceptions apply. For example, IBM DB2 Connect Enterprise Edition Fix Pack 9.7.0.7 (the 7th fix pack) has different licensing documentation compared to IBM DB2 Connect Enterprise Edition Fix Pack 9.7.0.6 (6th fix pack). Floating User (FL) | A Floating License is a license for a single software installation that can be shared among multiple team members; however, the total number of concurrent users cannot exceed the number of Floating licenses purchased. FL are CONC per install. An example of a product using the FL metric: IBM Rational DOORS v9.5. Full Capacity (FullCap) | Metric associated with the PVU (Processor Value Unit) and the P/RVU (Resource Value Unit – based on PVU) metrics, by which all processors (and cores) of the underlying hardware must be licensed. The major consequence for IBM customers is that the licensing of virtual machines (LPAR) does not limit licensing to just the virtual environment, but the full underlying hardware must be licensed (exceptions apply, see virtualization as a means to reduce licensing, limited to selected technologies). Full Capacity and Sub-Capacity present in IBM audit major and complex pitfalls for IBM customers. FullCap | See Full Capacity. Floating User Single Session Single Install (FUSSSI) | One of IBM’s user metrics. A FUSSSI is a Floating User, where each separate simultaneous session opened on each seperate installation of the software is to be licensed. An example of a product which may be licensed using the FUSSSI metric: IBM Informix Ultimate Edition V11.70. General Availability (GA) | Date from which a product of a specific edition and version is available for purchase, depending, however, on language, region, electronic vs. media availability. Announced by a PLET General Availability. This date is one of the most important dates in the Software Life Cycle (with End of Support EOS). A product version/release is published in the IBM Lifecycle database at GA.
Geography (in Metrics) | Seldom, metrics take geography into account as a metric attribute. For instance, the Establishment metric requires entitlements per establishment, defined usually as any establishment of a legal entity in a 50km geo-fenced area. Also some metrics take into account Continents, defined usually as three world regions – EMEA (Europe, Middle East, Africa), AM (Americas – incl. North, Central and South Americas) and APAU (Asia, Pacific, Australia – incl. New Zealand and Oceania). Geography in Sub-Capacity | SubCap counting rules (IBM term: Virtualization Capacity License Counting Rules) are applicable for servers located within the same ILMT Region. Three ILMT Regions are defined, based on geographical continents: Region 1 – America (North America, Central and South America), Region 2 – Europe & Africa, Region 3 – Asia & Australia (incl. Middle-East). SubCap is not permitted for servers spanning across two or three regions. Hardware Metrics (IBM term: Capacity-Based Licensing) | Metrics based on hardware-related attributes, such as number of sockets, number of cores, etc. The most usual IBM hardware metric is Processor Value Unit (PVU). Hyper-Threading (HT) | Hyper-threading simulates a higher number of physical cores by applying a HT factor (2, 4, 8, etc.) to the physical cores. Usually customers do not know which setting in a scan tool should be set so that the scan tool detects the hyper-threading, e.g. the difference between physical cores and hyper-threaded cores. However, only the physical cores – not the hyper-threaded cores – are to be licensed, so IBM customers should clean out their technical data of hyper-threading bias in order to avoid paying unnecessary licenses. In order to reduce license demand, customers should either set their scan tool to automatically detect HT or clean out data manually. IBM Customer Agreement (ICA) | An agreement under which IBM software products are licensed. The ICA is signed by the customer and by IBM. IBM Product And Licensing Expertise | The only way for you to verify your compliance, reduce licensing costs and financial risk, and preserve your rights when audited by IBM. OMTCO is a company with comprehensive expertise in IBM licensing and extensive experience in IBM counter-audits. Your OMTCO representative is at your disposal to discuss your challenges, advise you, and to act on your behalf. IBM Server Workbooks (ISWs) | Workbooks in Excel format for easy access, used to collect installations and attributes necessary for licensing. IBM auditors usually propose the use of their workbooks to audited customers. However, these workbooks often do not include aspects required to prevent unnecessary costs: crucial attributes are often missing (such as hyper-threading, clustering, deactivated cores). OMTCO’s ISWs are adapted for customers and aimed at collecting all the information necessary for licensing at fair, reduced costs, i.e. all required information on installations, server environments, hardware attributes and users. Ask OMTCO for details. Information Technology Infrastructure Library (ITIL) | Set of practices and references for IT Service Management. The current edition is ITIL 2011, which updated the previous 2007 edition. ITIL is comprised of five core publications covering the IT life cycle. We recommend management teams to take their roots from the ITIL framework, but in reality commercial organizations do not have much scope for implementing ITIL to the letter. Initial Fixed Term License (in/FTL) | First term purchase of a Fixed Term License. IBM offers different terms, usually one year. The IBM license contains then the terms: “Initial Fixed Term License + SW Maintenance 12 Months”. (International) Enterprise Software & Service Option (ESSO/iESSO) | Customer specific agreement. (i)ESSO agreements are contract forms which do not include use rights, only maintenance and options. Exception: if the (i)ESSO agreement is negotiated as a result of a compliance audit, a settlement schedule with settlement licenses, maintenance and reinstatements may be appended. The settlement schedule is then signed with the iESSO contract. (i)ESSO agreements offer benefits to IBM customers – but also drawbacks, especially those associated with mandatory maintenance. We recommend a thorough analysis to determine whether or not a specific customer should enter an (i)ESSO agreement. International Passport Advantage Agreement (IPAA) | An agreement for Passport Advantage or Passport Advantage Express (IPAA/IPAAe). IPAA(e) is a standard IBM agreement which is generic, and not customized to the customer’s specificities. IPPA(e) is mandatory to enter the world of Passport Advantage. International Program License Agreement (IPLA) | An agreement under which IBM software products are licensed. The IPLA is shipped with the product and does not require signatures. iSeries | The Integrated Series from IBM, which has evolved from AS/400 and is now called System i.
ISO/IEC 19770-1:2012 | Standard for Software Asset Management from the International Organization for Standardization (ISO). ISO defines: “ISO/IEC 19770-1:2012 establishes a baseline for an integrated set of processes for Software Asset Management (SAM), divided into tiers to allow for incremental implementation, assessment and recognition”. ISO 19770-1:2012 has emerged from the previous version ISO 19770-1:2006. ISO 19770-1:2012 and ISO 19770-1:2006 differs in major aspects: ISO 19770-1:2012 has abandoned the idea to define Software Asset Management, and proposes only a baseline; ISO 19770-1:2012 proposes tiers of incremental implementation, whereas ISO 19770-1:2006 set an unreachable, too high standard; ISO 19770-1:2012 has no pretension to effectiveness, although ISO 19770-1:2006 had: “(Software Asset Management is) the effective management, control and protection of software assets within an organization”. Legacy Hardware Metrics (CAP, PLU, SERV) | Legacy processor-based metrics including, among others, Capacity Unit (CAP), Processor Licensing Unit (PLU) and Server Unit (SERV) – all converted into PVUs with fixed conversion factors, e.g.1 PLU = 100 PVUs. License Demand | Position showing the required use rights, e.g. from entitlements (licenses, maintenance) and customer’s agreements (Unlimited Agreement, etc). The License Demand is derived from the Technical Usage, firstly by pre-selecting the optimum permitted metric based on technical data, and secondly confirming/changing this selection by matching it with the commercial data. In the end, not just any License Demand should be determined, but the optimum License Demand that makes the most out of customer’s commercial estate (use rights). License Compliance Table (LCT) | Matching both the demand and offer in a two-sided balance, showing the customer’s compliance position for each single product, edition,version in use (differentiated per metric). The demand side of the balance is generated by the License Demand – derived from the technical data –, whereas the offer side of the balance is generated by the Effective License Position (ELP) – derived from the commercial data. All incompliant positions are aggregated into the overall incompliance position, often expressed as a monetary figure. Licensing Information (LI) | Product-specific documentation of licensing rules. Relevant LIs and PLETs are associated, in parts redundant, and together form the major part of the licensing rules documentation (further documents exist). LIs are specific to a product, edition, version (incl. sub-version, sub-sub-version, etc. ), and more rarely specific to a hotfix or an installation date. LIs are usually published three months before the availability of the products. LIs and PLETs are somewhat difficult to find and understand by those with less expertise. We highly recommend assistance from an IBM licensing expert when searching for, and interpreting, LI documents. Lotus Knowledge Base | An interactive, web-based support tool allowing a customer to search for specific support information. Metric | Metrics define how usage is measured. If several metrics are applicable for a specific installation (product/version), then the IBM customer may select one metric and license the product using the chosen metric. We usually classify metrics in terms of: hardware metrics (IBM term: capacity-based licensing), user metrics (IBM term: user-based licensing), and other metrics. The applicable metric(s) is/are documented in the LI(s) and PLET(s) appropriate to the software edition and version (and occasionally, installation date and hot fix). The most common metrics are defined in this glossary: capacity-based (hardware) metrics such as Processor Value Unit (PVU), Resource Value Unit based on PVU (P/RVU), Install; and user metrics such as Authorized User (AUTH), Concurrent User (CONC), Floating User (FL), Authorized User Single Install (AUSI), Floating User Single Session Single Install (FUSSSI) and User Value Unit (UVU). Metrics based on Processing Power | Metrics based usually on Millions of Instructions per Second (MIPS), or Millions of Service Units (MSUs), whereas MSU is a measurement of the amount of processing a computer (usually an IBM mainframe) can perform in one hour. Monthly License Charge (MLC) | Pricing methodology for some software products, primarily mainframe, which involves monthly payments. Normalize Installations | Normalize all installations with their relevant attributes in a common format e.g. IBM Server Workbooks (ISWs). All information on installations and their attributes is generated as outputs from various scan tools (TAD4D, ITLCM, iQSonar) and manual collection – all gathered in different formats, hence the need for normalization. One Time Charge (OTC) | Pricing methodology for most software products which are purchased by a single payment at the time of ordering/purchasing the product. Parallel Sysplex License Charge (PSLC) | A special software pricing methodology for mainframe customers receiving the benefits of the parallel Sysplex technology. Passport Advantage (PPA) | A system proposed by IBM to its customers with different obligations and rights (agreed in the International Passport Advantage Agreement) and services around the purchasing of entitlements in sites (identified by a unique site number), e.g. one-click payment, automatic renewal, reports, etc. All eligible entitlements, that is, entitlements available in PPA, may be purchased in a site: perpetual and FTL licenses, Subscription & Support (S&S), Fixed Term Licenses (FTL), reinstatements, migrations and trade-ups. Proof of Entitlements (PoE) may be downloaded for a limited time, in PDF format. Diverse reports, e.g. active maintenance, historical purchases, renewals, may be exported in XML or Excel format. Primary License Charge (PLC) | A method of paying for some IBM software products, usually as a part of a PLC/ALC (Primary License Charge / Annual License Charge) agreement. Paul Rand | A American graphic designer, best known for his corporate logo designs, including the logo for IBM, designed in 1972. The IBM logo was designed in a blue color with 8 bands, and has been replaced, after nearly 40 years, by a black version. Paul Rand also designed corporate logos for UPS, Enron, Westinghouse, ABC and NeXT. Problem Management Record (PMR) | A record of the activities performed during the course of resolving a problem reported by an IBM customer. Customers with access to IBMLink can view their PMRs. Can be used as a verb, such as: “to PMR a problem”, “to PMR IBM”. Processor Value Unit (PVU) | A metric where the PVUs are counted by each activated, physical processor core. The PVU table shows the PVUs given for each processor technology. PVUs are calculated using a simple formula – but the associated processor counting rule depends on many criteria and is somewhat difficult to apply by those with less expertise in the matter. An example of a product licensable using the PVU metric is IBM WebSphere MQ V7.5. (Processor) Resource Value Unit (P/RVU) | An associated metric of the PVU metric, considering the PVUs of all attached or managed devices. Used often in the Tivoli brand, such as in TAD4D Tivoli Asset Discovery for Distributed. Program Announcement Letters (PLETs) | Product-specific documentation usually published in a preliminary version three months before the launch of a new product (or new edition or new version). Relevant LIs and PLETs are associated, overlapping in parts, sometimes contradictory, and together form the major part of the licensing rules documentation (further documents exist). LIs are specific to a product, edition, version (incl. sub-version, sub-sub-version, etc. ), and more rarely specific to a hotfix. PLETs can be corrected at any time, very often up to one day before launch. LIs and PLETs are somewhat difficult to find and understand by those with less knowledge in licensing. We highly recommend assistance from an IBM licensing expert to avoid misinterpretation. Proof of Entitlement (PoE) | Hard or soft copy of an entitlement, which is necessary to prove the use rights of an entitlement. Note to IBM customers using PPA: IBM PoEs are only available in PPA for download for a limited time, in PDF format; hence, we recommend them to be printed out and archived systematically. The best method is to use an IBM PoE archive service (details with OMTCO). PoEs from PPA should not be confused with PPA reports in XML/Excel format, which are not formal proofs of entitlement, but are currently accepted by IBM as sufficient proof. How long IBM will continue to tolerate PPA reports as sufficient proof is unknown. pSeries | The Performance Series from IBM, which has evolved from RS/6000 and is now called System p.
Recurring License Charge (RLC) | A method of paying for some IBM software products. Relationship Suggested Volume Price (RSVP) | The price level for a specific customer determined by the point value of customers’ initial order. The Base Level (BL) is set for the very first purchase by the customer, and points accumulate with each purchase to increase the discount. Upon the Anniversary Date of the customer’s passport advantage sites, the pricing level is re-established, although any downward adjustments are limited to a maximum of 2 levels. The levels are currently BL (base line), discounted at levels D, E, F, G, H, I and J for corporate customers. Higher discount rates are only proposed through an iESSO contract or to non-corporate customers (education, government). Resource Value Unit (RVU) | A metric where the counting rule counts the number of resources either used or managed by the software program. The resources are then converted to the required number of RVU entitlements, i.e. the specific RVU documented in the applicable PLETs/LIs. P/RVU is the Resource Value Unit metric (based on PVU), hence the cumulated number of PVUs of all used and managed resources is to be counted. Sales Volume Price (SVP) | A letter between D and J which gives the customer’s relative level in the Passport Advantage program. Server (In Licensing) | Server (current) is a metric where the number of installations on servers, or number of managed servers, is counted. Usually each separable device, such as racks and blades, is to be counted as one server (read the PLET/LI for each product/edition/version to check for differences in licensing and additional restrictions). Note that the current Server metric follows the principles of Full Capacity: software partitioning is irrelevant to licensing, whereas hard partitions are considered separate servers. This current metric should not be confused with the legacy Server metric, which was replaced in July 2006 by the current PVU metric. The legacy Server metric was migrated to PVUs with a fixed conversion ratio. Software Asset Management Tool (SAM Tool) | Tool to manage entitlements and installations, such as SmartTrack (Aspera), Spider LCM (brainwaregroup), SNOW License Manager, FrontRange License Manager or Matrix42/U4U. Secure Data Room | Infrastructure on customer’s premises constituted by a dedicated room containing stand-alone computers with no network connection, used exclusively by auditors in order to work on confidential customer data. This data never leaves the Secure Data Room and the customer’s premises. Usually auditors sign a special confidentiality agreement – with very strong obligations and contractual penalties – before being permitted access to any data in the secure data room. OMTCO recommends monitoring auditors in the secure data room continuously during work hours. OMTCO proposes mobile Secure Data Rooms available for all corporate customers. Settlement | Conclusion of the dispute process of the compliance review. The settlement usually comprises an audit relief for the customer’s benefit and a settlement penalty for the vendor’s benefit (associated with a purchase of entitlements, such as licenses, maintenance, reinstatements or trade-ups). The settlement re-establishes compliance to all discovered installations and reported usage. The customer’s incompliance is then solved – for the time period before settlement agreement date. Undisclosed incompliance and future incompliance are excluded de facto from a settlement: a settlement does not attest compliance. Shrinkwrap (Shrink-wrap) | Software Product available on physical media (DVD) with a shrink-wrapped license agreement, which is accepted by opening the software package and breaking the seal to get to the media. In non-IBM language this is also called a Full Package Product (FPP). Single Point of Contact (SPOC) | One person who is nominated to be the single contact to the auditor and the vendor in all audit matters. Often issued from the (counter-) audit project or from license management. A SPOC for all audit matters is strongly recommended in order to keep consistency in the audit and to protect the rights of the customer. OMTCO may be your audit SPOC and act on your behalf. Sites (Passport Advantage PPA) | A portal in PPA for services associated with purchasing entitlements. Customers create a site, where one site represents a purchasing location – not a geographical one – with one administrator (IBM term: primary contact), participants (IBM term: secondary contacts), a payer, a marketing contact, etc. Software Asset Management (SAM)| Organization and processes, data and tools, necessary to manage the lifecycle of the software assets transparently, legally and economically. As ISO 19770-1:2012 (Software Asset Management) standard states: ““ISO/IEC 19770-1:2012 establishes a baseline for an integrated set of processes for Software Asset Management (SAM), divided into tiers to allow for incremental implementation, assessment and recognition”. Software Problem Report (SPR) | A record in the Lotus software problem reporting system that is used to track an identified software problem – similar to IBM’s APAR; however, an SPR may also be used within the incident tracking database to classify an incident’s status. Sub-Capacity (SubCap, Virtualization Capacity) | SubCap (or in modern IBM term: Virtualization Capacity) is a way of counting processor cores by the calculation of required PVUs in the PVU and P/RVU metrics. SubCap lets IBM customers license a program in an environment virtualized for less than the Full Capacity if the program is eligible, the virtualization technology is eligible, the underlying hardware is eligible and the IBM customer has fulfilled the SubCap requirements for each server entitled to SubCap for more than continuous 24 months. Fulfilling SubCap requirements is a challenge – IBM customers should consult an IBM licensing expert for external support. Sub-Capacity Attachment to IPAA | Supplementary agreement, precondition to Sub-Capacity. Included since July 2011 in IPAA. Support ID (SID) | A unique number that identifies a Designated Caller or a set of callers. The SID is used by the Lotus telephone system to automatically verify an entitlement. Subsequent Fixed Term License (su/FTL) | The renewal of an Initial Fixed Term License – or of a Subsequent Fixed Term License – for an additional 12 month fixed term and in each term year thereafter. System Support Agreement (SSA) | An expanded maintenance agreement which includes some level of enhanced software support services. Table of Processor Value Units per Core | A table from IBM listing available processor technologies and showing the number of PVUs per core in the PVU metric. This table is regularly updated – usually monthly – and is available in the public area of the IBM website. Technical Usage | Demand generated by the installations and their relevant attributes. Ultimately constitutes the fundamentals of the License Demand – one side of the Licensing Compliance Balance. (IBM) Tivoli Asset Discovery for Distributed (TAD4D) | TAD4D and ILMT use the same agent on the devices they manage. The difference between the two is that ILMT only recognizes IBM software, whereas TAD4D recognizes all vendors (limited to the software products in the SKBT – Software Knowledge Base Toolkit, the IBM standard software catalog, extended with customer-specific signatures). The implementation of TAD4D or ILMT is the main obstacle for customers wishing to implement Sub-Capacity. Transfers of Entitlements | The only means to reach compliance on a site number level, and hence on an entity level. IBM permits a group balance (refer to IBM standard agreement) for a corporation with several site numbers, so compliance on a group level may not actually mean compliance at each site. Transfers in PPA are an administrative process with IBM. Receiving sites provide information – usually to their IBM sales representative – as to which entitlements they should receive, and from which giving sites. The giving sites’ authorization is then required. Your IBM sales representative may provide you with the necessary form to be filled out in order to trigger transfers. User Access List | A list of all users and their access credentials and authorities (their roles). User Metrics (User-Based Licensing) | Metrics defined by how many and which users how access the program. The most common user metric is the Authorized User (AUTH) metric. Further restrictions define variations, e.g. Concurrent User (CONC), Floating User (FL), Authorized User Single Install (AUSI), Concurrent User Session (CONC/S), Concurrent Node Lock (CONC/NODE), Floating User Single Session Single Install (FUSSSI), User Value Unit (UVU). User metrics may be combined with further restrictions, such as on the type of user – as in the Authorized User Value Unit metric (AUVU), the Employee User Value Unit (EUVU), or the External User Value Unit (XUVU) – or on limited secondary use rights. User Value Unit (UVU) | A metric by which users’ access to the program are counted and converted to the required number of UVU entitlements. The conversion table is found in the program-specific UVU table in the relevant LI document. UVUs have many variations, such as the Authorized User Value Unit (AUVU), the infrequent AUVU (inf.AUVU), the Employee User Value Unit (EUVU), or the External User Value Unit (XUVU). An example of a product licensable per UVU: IBM Tivoli Identity Manager 5.1; per AVU: IBM FileNet Content Manager Authorized v5.1; per EVU: IBM FileNet Content Manager Employee v5.1,; per EVU: IBM FileNet Content Manager External v5.1. Virtualization | A technology used for infrastructure flexibility and scalability, with which the physical device is abstracted. If several devices are collated, the resources of all physical devices are collated into a common resource available to the virtualized environments. IBM offers the Sub-Capacity (SubCap) licensing counting rule, in order to license the virtualized environment (Virtual Machine VM, or Logical Partition LPAR) only. However, IBM customers have no rights to the Sub-Capacity system unless they fulfill, on each single server aimed to be licensed with SubCap, the SubCap requirements for 24 months. Breaking the requirements annihilates the 24 months mandatory duration – and the period starts from scratch for another 24 month duration. WebSphere | A brand of products from IBM used for integration and optimization. WebSphere MQ (WSMQ) is often used in licensing, as WSMQ shows stable licensing per PVU, with few restrictions and editions. zEnterprise (IBM eServer zSeries, IBM System z, IBM zEnterprise) | An IBM brand name which refers to IBM mainframe computers, where the letter z stands for zero downtime. Before the year 2000, the mainframe brand had been known as System/390. In 2000 IBM rebranded it as IBM eServer zSeries, starting with the z900 (previously known as System/390). A new generation of products was launched in April 2006, rebranded as “IBM System z”. So IBM System z includes (from oldest to newest) IBM eServer zSeries, IBM System z9, IBM System z10, and IBM zEnterprise. 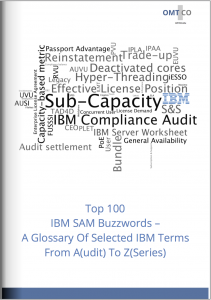 THIS GLOSSARY DISPELS THE MYSTERY THAT SURROUNDS IBM’S SAM (SOFTWARE ASSET MANAGEMENT) TERMS AND LICENSING VOCABULARY. IT WILL HELP YOU TO UNDERSTAND AUDITORS’ BUZZWORDS, ULTIMATELY MAKING YOU SOUND LIKE AN EXPERT.